I was 18 the first time I came across flower essences and working as a waitress in in London whilst at the same time studying to be a drama teacher. One of the other waitresses presented me with the list and uses of the Bach Flower remedies one evening before work and my first reaction was, “Yes I need them all!” I began using Bach flower remedies straight away and carried on doing so for many years. I am sure their subtle but effective action on my emotional and mental states throughout the years have played a crucial role in my own healing journey. Since then I have gone on to discover other flower essence makers and now many of the essences I use, I make myself. Dr Bach was a homeopath and believed that the cause of disease was emotional, a conflict between soul and mind that needed spiritual and mental effort to eradicate it. He speaks in his work ‘Heal Thyself’ about his belief in the existence of the soul and how the root of disease and unhappiness is often linked with conflict from either the material world or other people leading one away from the soul’s real path. The second major theme that Dr Bach relates to health is that of unity and interrelatedness, he outlined some of the human defects that he believed to be adverse to unity such as pride, cruelty, hate, self-love, ignorance and greed stating that illness sets in if one continues in these defects after knowing they are wrong. I have met flower essence practitioners who will only work with the 38 Bach remedies believing that Dr Bach created a range of remedies that were complete and that there is no need to diverge from them. I personally believe that the system and remedies that Dr Bach offered to the world in the 1930’s had and still have their work to do but there is absolutely no reason why his system shouldn’t be used to experiment with other plants and continue to add to what is now becoming a vast information base of flower essences. There are as many essences out there as there are plants; by making one’s own essences, herbalists and practitioners will find the flowers that speak to them personally and through this relationship be able to hear when it is the right time to suggest one to a patient. Flower essences are the vibrational message of a flower transmitted to water by solarisation, and the vibrational resonance of the flower is memorised by the water. Today in my work as a herbalist, I make flower essences to use with patients. A certain plant will attract my attention and I may feel drawn to make an essence. Just before or during the process, I sit with the flower and listen and meditate (over the years I have learnt to listen and not get way-laid with mental doubts or questioning); I jot down in my notebook what comes up. I will later trial the essence myself and ask colleagues to trial it too in order to build up a picture of the plant’s message and how it can be used in herbal practice. As herbalists we are more often than not confronted by patients who are already showing physical signs of illness or disease, it is these physical signs that motivate them to come and see us in the first place. Although it would be advantageous to see patients at the first signs of emotional or mental imbalance most patients wouldn’t think about visiting a herbalist before being physically ill. However once a patient comes to a herbalist for a physical disorder I believe that it is beneficial to try and work on several levels of healing: the removal of physical symptoms in order to relieve the patient of pain and discomfort, the lifestyle changes necessary to avoid the problem repeating itself, and the emotional and mental issues that may be underlying the illness. I have found that generally the more a plant preparation is concentrated, the more likely it is to work on a deeply physical level, and the more a preparation is diluted, the more likely it is to shift things on a more subtle level. This does not mean that concentrated plant medicines do not have an effect on emotions or vice versa but for example if I want to zap an infectious bacteria I am more likely to use an essential oil with a high phenol content over a flower essence and if I am looking for direction in line with one’s higher self, flower essences would be my choice. Making essences is an extremely simple procedure, however to obtain a quality remedy, a certain frame of mind and attention to detail is needed. I love the way that with flower essences, toxicity is not an issue, if you find yourself attracted to a certain flower, go ahead and make an essence with it, no molecular trace of the plant will be found in the finished essence. Having said that, when one of the young botanists at the herbal school where I teach decided that he wanted to make a range of essences with extremely toxic plants such as belladonna (Atropa belladonna), datura (Datura stramonium) and henbane (Hyoscyamus niger), we guided him away from this idea. Although the flower essences would not do any harm physically, energetically he was definitely not ready to work with this type of plant, which could have dangerous implications emotionally if used without care, experience, and respect. Although flower essences do not demand any particular skill to make, one definitely needs to be ready for this type of medicine making, an understanding and awareness of an intuitive nature is necessary. A small glass bowl, which should be used uniquely for essence making. 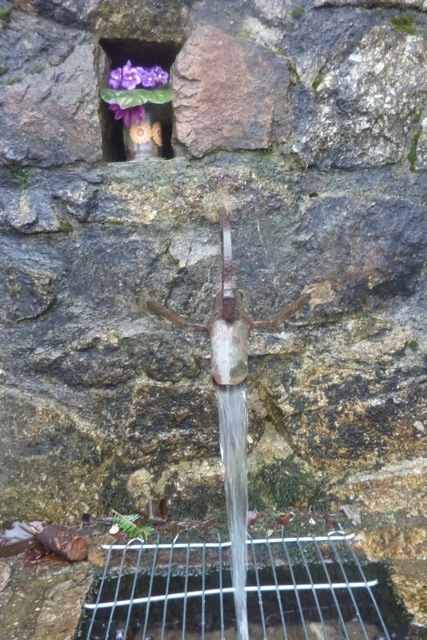 Fresh spring or mountain stream water collected in a glass container if possible, it is great if you can get fresh, wild water that comes from near to where the flowers that you are using grow. This is not always possible so either collect spring water from somewhere else or if all else fails buy spring water in a bottle. I do not advice using tap water as it will be full of fluoride etc. Before picking the flowers use your intuition to feel whether or not you have their permission. Flower essences are made on sunny days as the sun’s rays shining through the flowers help transmit the message to the water, this is known as solarisation. Fill the bowl with spring water and put in the sun, preferably among the flowers that the essence is being made out of. It is the vibrational imprint of the flowers that is going to be memorised by the water, not the vibrational imprint of the essence maker. In order to put the least possible of one’s own energy into the essence, consciously distance your self from the action. By this, I mean when collecting the flowers imagine for example you are just an instrument, try and remain neutral. Gently drop the flowers onto the surface of the water; this is not an infusion so they do not need to be immersed. Cover the surface of the water. Leave in the sun for at least 2 hours, where there is no risk of shadows falling on the bowl. Come back to the bowl and with the help of a couple of twigs or leaves (so not to touch the water) remove the flowers from the bowl. Using the glass funnel, pour into the glass bottle until it is half full, fill up to the top with the alcohol. Once back inside take 7 drops from the mother tincture and put them into a bottle (20ml) and fill up with alcohol, this is the stock bottle. It is from this bottle that the medicine bottle (that which is sold in shops as a flower essence) is made, put 2-7 drops into a small dropper bottle and fill with alcohol, label and this is ready for the patient. I tend to advise patients to take a couple of drops in water or directly under the tongue when they think about it but preferably as far away from meals as possible. Many people carry the small dropper bottle on them at first and take the essences regularly, when they start to forget it is usually because the essence has done its job and there is less need for it. However as their action is subtle, I do try and encourage patients to take essences for at least twenty-one days and depending on the issues being dealt with for up to three months. It is possible to blend essences and each practitioner has their own techniques, I tend to go for one essence at a time and would advice not to blend any more than three at a time. Once things have started to shift a change of essence can be helpful as the next emotional layer is revealed. Last May, whilst staying in a family house in the Ardeche region of France, I came across the most beautiful field full of wild flowers and orchids. I had been thinking about making a wild orchid essence for some time but as orchids usually grow here alone or in tiny communities, the opportunity had not arisen (Saskia from Saskia’s flower essences, later told me that you can actually make essences with out picking the flowers but just by leaving the bowl of water nearby). Straight away I knew that it was an invitation to make some flower essences and maybe even an orchid essence. I organised all that I would need and set the three days aside the following weekend to come back alone especially for this. The first day I spent getting rid of emotional stuff that was bothering me, meditating and getting into tune with myself, in order to be in the right frame of mind, the second and third day I spent essence making. 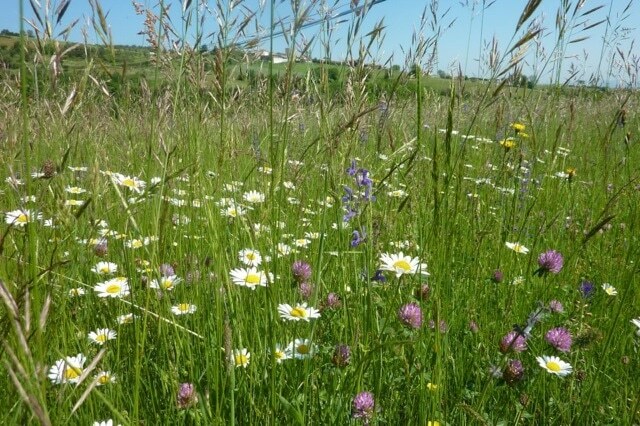 The field was teaming with wild flowers and two species of orchids, Heath spotted orchid (Dactylorhiza maculate) in abundance and burnt orchid (neotinea ustulata) that was nearing the end of its vegetative cycle. Following my instinct and meditating with the flowers of each essence I made, I spent two days making the following essences (the descriptions next to them are the notes I took during the process). Jersey thrift (Armeria arenaria) – helps the sense of community, working for the whole, service, fluidity and moving together in the same direction. 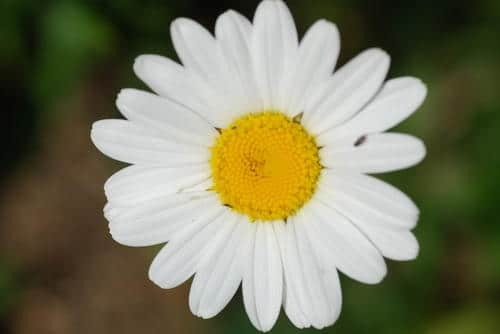 Oxeye daisy (Leucanthemum vulgare) – total opening without fear, no holding back, confidence in being oneself, honesty, simplicity, innocence. ‘What you see is what you get’. Giving freely and being able to receive, joy, open heart. 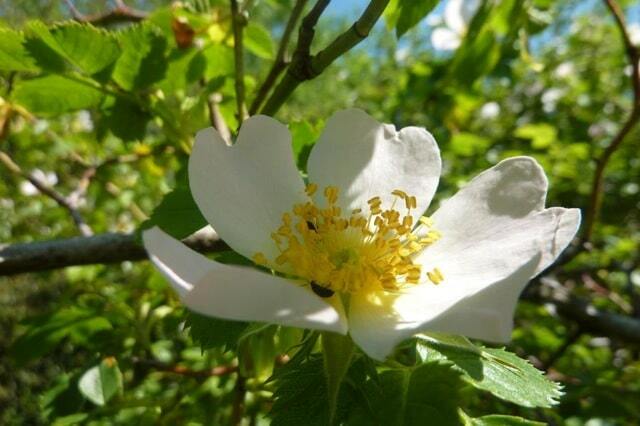 Dog rose (Rosa canina) – Soft, gentle, loving, caring, motherly, warming caressing, holds you, tender, feminine, generational healing. Wild sage (Salvia pratensis) – force, power, defence, strength, be in the here and now, leadership qualities, balanced energies. ‘To have backbone’, linking earth and sky energy. 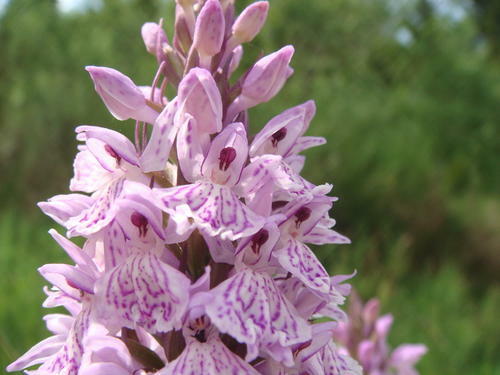 Heath spotted orchid (Dactylorhiza maculata) – subtle energies, high resonance, a teacher in fine-tuning, spiritual connection, guide, unconditional love, an aerial for global love/universal love, leading us into the future. It is only now, writing out these notes that I notice fully how much these essences seem to be right for the needs of today. I would have loved to make an essence from the burnt orchid but there were not many left and I knew that even by taking just a few flowers from each flower head, it was not right, I decided therefore just to sit with it. What happened next has no words to describe and there is no need as each one of us builds our own unique relationship with the plants we spend time with. 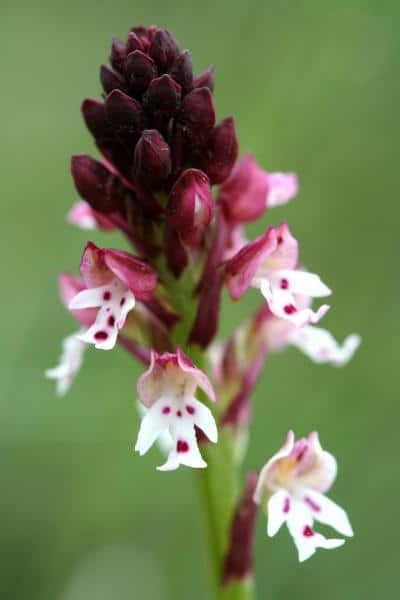 It is sufficient to say that the tiny burnt orchid backed up the information I had already learnt from the heath spotted orchid, that is orchids are not just highly evolved botanically, they are also highly evolved beings, here to guide us in this time of planetary change. The orchid essence I made that day is very powerful; I have been trailing it as has my flower essence maker friend Saskia from Saskia’s flower essences, the conclusion that we have come to is that this particular essence is at the moment working on the level of ‘healing the healer’ rather than the patient for the moment. 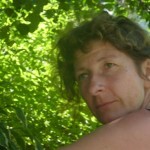 Cathy has been working and living in rural France for the last 20 years. She obtained the herbalist diploma from Lyons school of Medicinal Plants where she now teaches botany field study, healing with plants and herbal gardening. 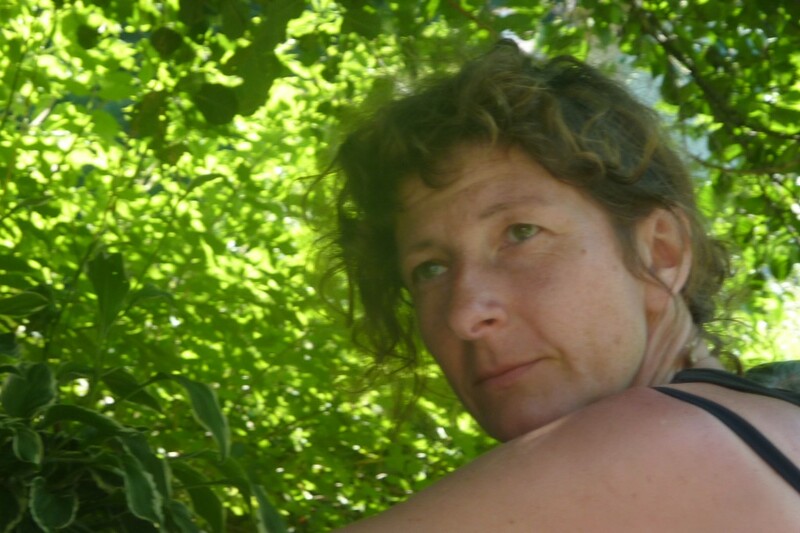 Cathy is one of the founding members and coordinators of the new multi-language herbal network Herbalistes sans Frontières. 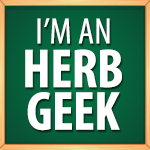 What a beautiful article, and excellent introduction for the beginning herbalist! I’d like to add that I’ve successfully made flower essences without picking the plant at all. This is especially easy when the flowers “droop” down a bit, but very often I’ve found you can position a jar or bowl of water on some platform (like a box or stone) to submerge the flower effectively. Sometimes it’s not possible, but it’s worth a try, and I think this technique can make even more powerful medicine in some cases. Thanks for your wonderful guidance! I am wanting to plant this particular tree as a symbol to heal the soil and the people where I live, Devers in Liberty County Tx, 77538. There are very many people here and there seems to be an old wound here as well. I would also like a bottle of oil as well, which comes from this tree. extracted is called Myrrh. I don’t know much about this plant. I just want to use it symbolically. I’m not sure what this means, but, here is some information I found that may help you in my request. Hi Cheryl, here is some info about the tree you are looking for http://www.plantzafrica.com/plantcd/commiphora.htm. I have never seen one growing but have used myrrh essentiel oil to aid in meditation. Crab apple flowers sound good, let me know how it goes, I would be interested to know what crab apple flowers have to teach us. I really appreciate your respectful and clear approach to creating and working with the flower essences. You’re absolutely right that the plants have so much to offer us, not just in terms of healing but as teachers! I’ve been making flower essences (from my home near Toronto) since 1995, and know from offering classes to others that the process of intimate, intuitive relationships with the plants that ‘call’ us is profoundly soul-making. As you say, getting in the right space to approach the plants is a fine art, but the wisdom that flows when we do this is utterly life-altering. Thank you for sharing your experience and insights. If you’d care to explore the Raven Essence system (over 300 essences), they are all published on my website. I also offer a free introductory divinatory reading using the essences, and would be delighted to share this with you at some point — A Moment with your Inner Gold. Sounds like the resulting remedy is primarily alcohol. How do we make it so that this is not the case? Substitute with distilled water as diluent? 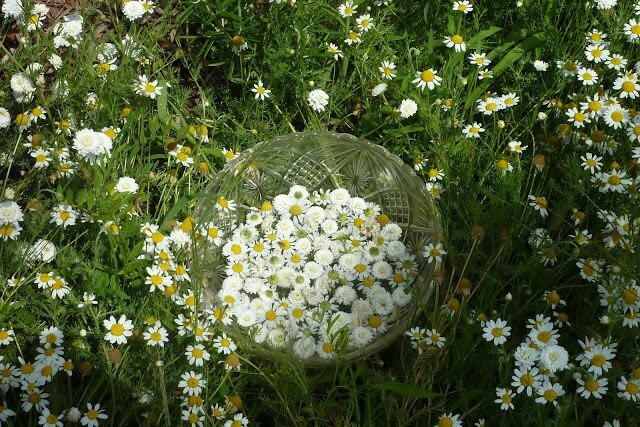 I want to create an educational activity for Girlscout Daisies having them fill their own ‘daisy’ or another flower, remedy bottle from the ‘mother’ solution. Please contact me if you have an ideas around this. I love your suggestion of letting the blossoms droop into the water while still attached to the whole plant, rather than pick the flowers and put them in water. Thanks very much for sharing this information. 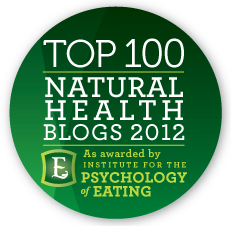 Thank you for sharing this information and inspiring readers to make their own medicines.